Sorry for the lack of updates, I've been nursing my bum thumb and typing lefty is a challenge. I had my surgery Thursday and it was a success. 2 screws were installed in my right thumb to re-attach broken bone and secure the joint. 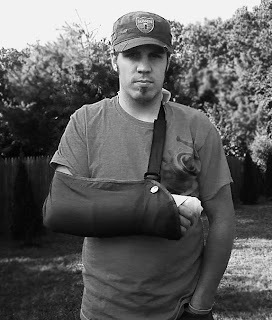 I'm stuck in a soft cast and sling till October 5th and then it looks like I'll be put in a hard cast and losing the sling. I owe a huge thanks to my good friend Erik who got me taken care of so quick. Lucky for me, Erik is an Orthopedic Physicians Assistant and hooked me up with Dr. Joyce, who in turn got me right into surgery due to the severity of my injury. I also owe my parents a huge thanks! I've been all doped up on very heavy pain meds since the surgery and I had doctors orders not to be left alone till I weened off to a lesser strength pain killer. T is away on business so my folks got stuck babysitting me for 3 days. So, I'm on the mend and with any luck will be riding sometime before Spring 2010.
i have a lot of stories to tell lately about how tough my friends are.